There are some television series from years ago that you never forget. Maybe it was a message that was given, a series that a child remembered, a sci-fi that allowed the mind to roam or a fun show that gave you the confidence to be cool Whichever it was, when you step into a building, shop or situation, a fond memory can be triggered from what you see. 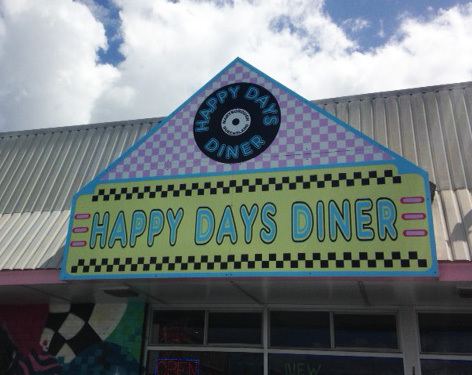 Happy Days Diner in Maryborough, Queensland has all the "cool" atmosphere, furniture and menu delights that will take you back to watching the iconic The Fonz and the Happy Days Gang. Decked out in 1950s memorabilia with large black and white vinyl floor squares, numerous photographs of famous movie stars and singers with LPs adorning the walls and a cute jukebox in the one corner of the large dining area, it gives the customers the feeling they have stepped back in time to a carefree era of fun and laughter. What makes this diner different from others is the full-size blue Chevrolet positioned in the middle of the eating area with its center cut out to accommodate six at a table. 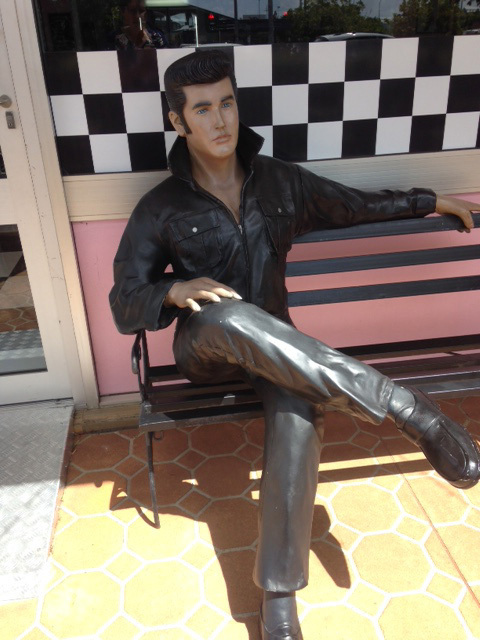 Other seating comprises of a table and chairs, bar stools set up against a long table overlooking the courtyard of umbrellas and tables The courtyard comes complete with Elvis resting on a chair at the door, just waiting to have his photograph taken with you. 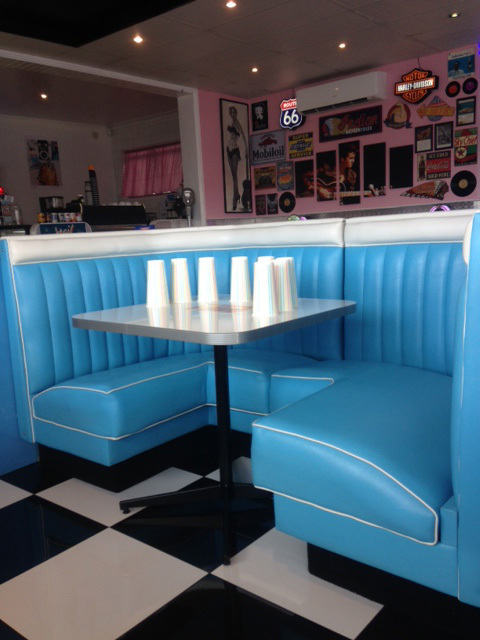 The colour theme of powder blue and pink compliments every aspect of the diner right down to the table napkins. Owners, Daryl and Donna, complement the diner dressed in 50's attire. 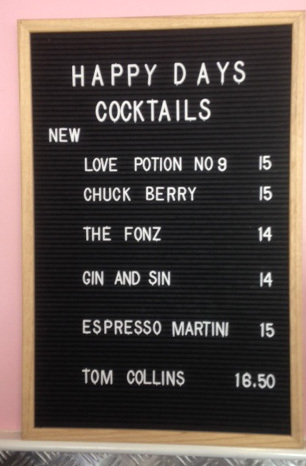 Apart from having the usual diner menu, Happy Days Diner offers cocktails listed varying in price from $14.00 to $18.50 each with some cool names such as 'Love Potion No. 9 and The Fonz'. If you are not into cocktails, there is a variety of Spyders, Floats, Smoothies, Juice, Coffee and Tea and for those who prefer an alternative beverage, why not try the Chai or the Turmeric Latte! Open each day from 8.00am morning tea, lunch and dinners are available with gluten/dairy dietary intolerance catered. For your next birthday, family get-together or friends out and about, book a table at Happy Days Diner at 92 Ferry Street Maryborough. There is plenty of off-street parking in close walking distance and if you are on holidays with the family dog, the courtyard is fully fenced allowing you and your dog to have lunch together. The diner opens at 8.00am with closing times varying depending on the day. Their Facebook page will advise you if the diner is open or shut, otherwise, you can ring Happy Days Diner on 07 4194 6086 for further information.